If you love buffalo chicken wings, then there's a way to turn this appetizer into a tasty meal for your whole family by making this delicious buffalo chicken pasta bake recipe. Buffalo chicken has three main flavor components: chicken, the buffalo sauce, which is a combination of butter/margarine and Louisana hot sauce, and the bleu cheese dipping sauce. This recipe incorporates all three flavors. While this recipe calls for you to cook the chicken ahead of time, you can save time by buying a pre-cooked rotisserie chicken at the grocery store and using it in place of the chicken breast or thigh meat suggsted here. Serve it with a simple green salad for a full meal. It serves six to eight people. In a large pot, cook the pasta according to package instructions. Drain and set aside. In a large sauté pan, heat the butter on medium-high until it shimmers. Add the onion and cook, stirring occasionally, until the onion is soft, 4 to 5 minutes. Add the chicken and cook, stirring occasionally, until the chicken is cooked through, another 5 minutes. Add the hot sauce, salt, pepper, and reserved pasta. Stir until well combined. Stir in the bleu cheese. Transfer the mixture to a casserole dish. Bake in the preheated oven until the cheese is melted and bubbly, about 10 minutes. Sprinkle with the chopped scallions. You can vary this in several ways. Not a fan of bleu cheese? No problem. Replace that with 4 ounces of your favorite grated cheese, such as cheddar or Monterey Jack cheese, or even an Italian hard cheese like Asiago or Parmesan. Replace the chicken with an equal amount of ground beef or turkey. Add a little extra zip by adding 1/8 to 1/4 teaspoon of cayenne to the hot sauce. 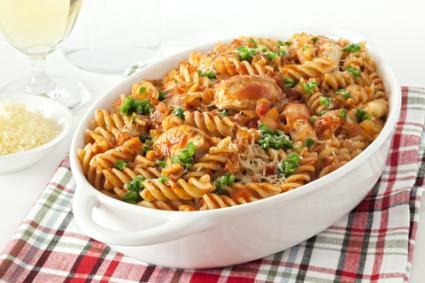 You can also make the pasta a little smoky by adding 1/2 teaspoon of smoked paprika or 1/4 to 1/2 teaspoon ground chipotle. Add 1 to 2 cups of steamed chopped veggies, such as broccoli or peas, to add a little green to your meal. Turning your favorite appetizer into a filling supper for your entire family. The recipe is easily customizable, and if you use pre-cooked meat, it comes together very quickly making it a perfect weeknight supper.